Good afternoon guys. Summer is approaching but we keep on working. Today our goal is to learn how to perform VAR analysis using Stata. Matlab users you may want to read this! It’s been a while (again) but now I am here, ready to cover an exciting chapter of time series analysis. Today the focus will be on vector autoregressive models alias VAR. These models are extremely helpful when we want to explain two or more series in terms of their own past realization and past realizations of the other series. So a VAR(3) it’s a model where each variable have three lags included as regressive terms. Of course, given that a VAR model is a multi-variate AR, we need stationary data to estimate it correctly. As we have already pointed out here (primalez), several macroeconomic series are far from being stationary and usually display some trend. 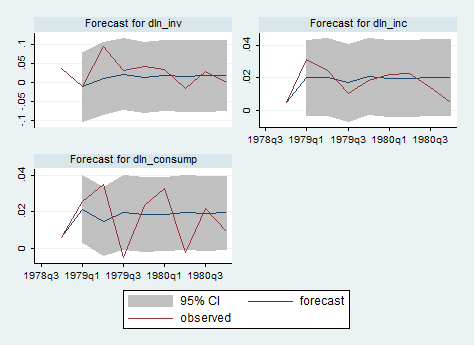 These are Quarterly SA West German macro data from 1960 to 1982 (long before I was born). Remember that, before starting any kind of analysis, you have to tell Stata your dataset is a time series one, using tsset. Taking a look at quarterly investment and real GDP from 1960 to 1982 shows us non-stationary time series having a clear upward trend, even though investments grew less over the period. 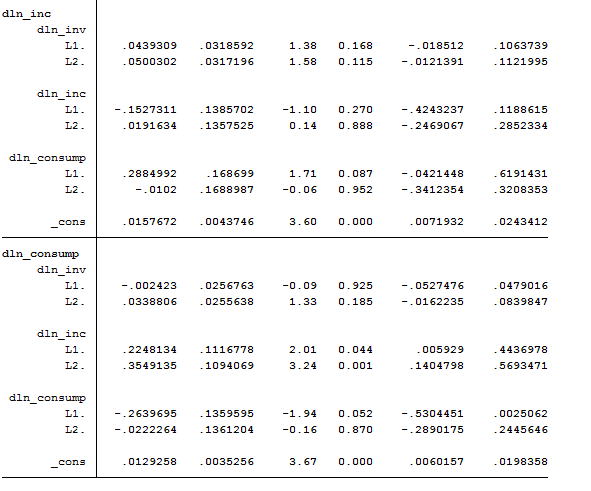 Our dataset already contains the first-differenced values of our variables so we can directly proceed to VAR-estimation. We can estimate this model with two fairly simple commands: var and varbasic. 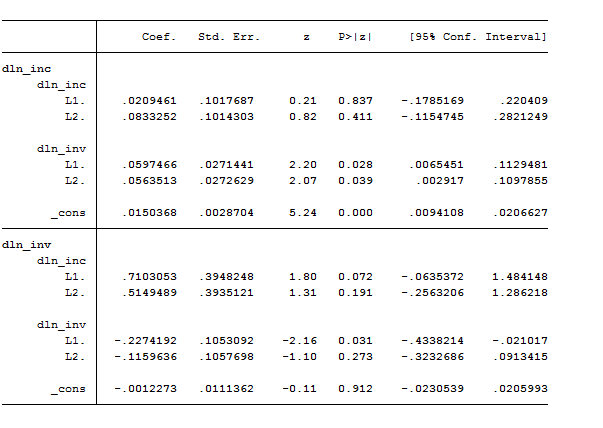 The var command’s output has two parts: a header and the standard Stata output table for the coefficients, standard errors, and confidence intervals. 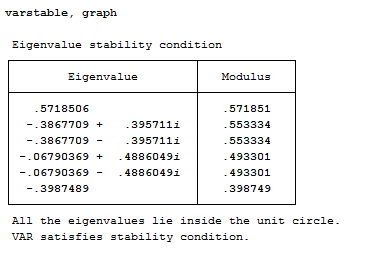 The header contains summary statistics for each equation in the VAR and statistics used in selecting the lag order of the VAR. 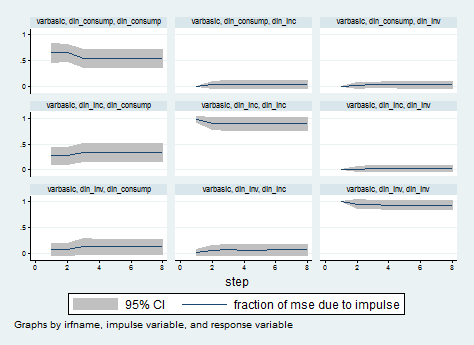 Given that we did not specify a lag order, Stata automatically perform a VAR with one or two lags. If we want to specify the lags instead, we have to be careful to write the option correctly. 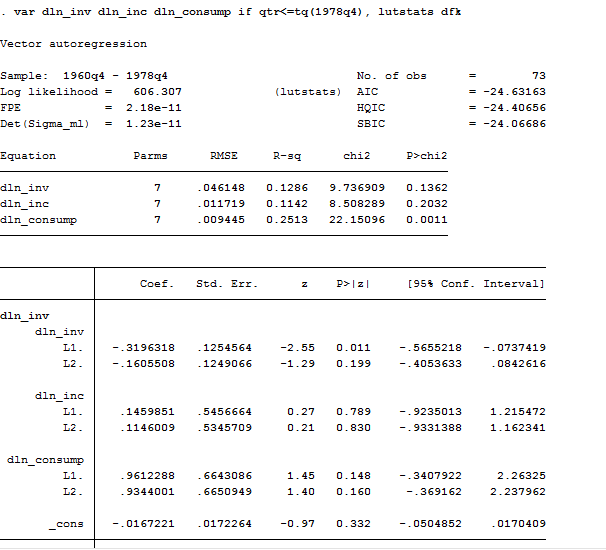 var dln_inc dln_inv, lags(2) //tells Stata to include just the second lag in the model specification. Remember that we can use the varsoc command to establish how many lags should be used for a specified model. Let’s skip the model part and go directly to impulse response functions, which describe which shock to a system of equations affects those equations over time. In economics we are usually interested in understanding how a sudden and unexpected change in one variable impact another variable over time. Here they are automatically computed by the varbasic command. 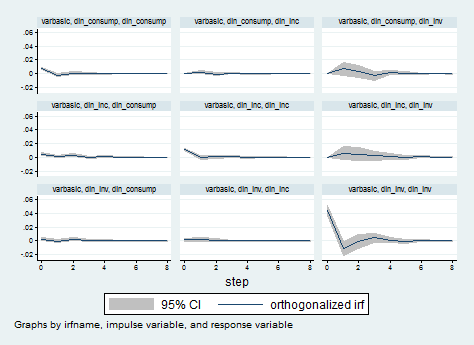 Now, I want to generate the impulse response function using the oirf command that yields orthogonal impulse response functions which correspond to selecting a Cholesky decomposition for the contemporaneous effects matrix. As you can see, the two IRF generated are almost the same! The blue line above represents the impulse response function and the grey band is the 95% confidence interval for the IRF. Notice how at about t= 3 (t is in quarter units) the response declines sharply after having a strong bound and becomes statistically insignificant.The contemporaneous effect of a 10% in differenced income is a little more than 4% for consumption. The effect of an unexpected increase in income would impact consumption immediately and these affects would last about one year. 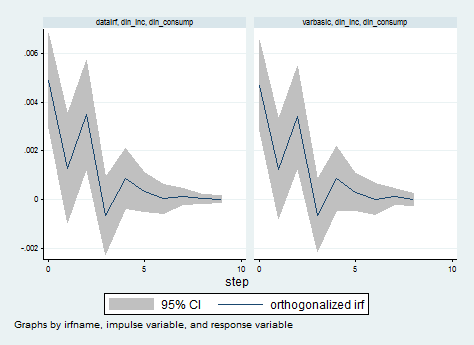 It’s possible to include exogenous variables in a VAR, simply including the exog() option in the regression. We are already confident with the basic notation so let’s introduce some more option to complicate a bit the stuff! 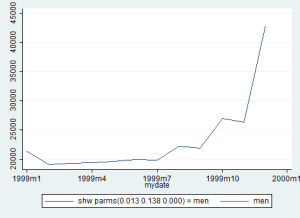 In this case, we tell Stata to consider the first-differenced log transformation of investments as the exogenous variable and we applied the VAR model only to the range period from 1964 to 1978. 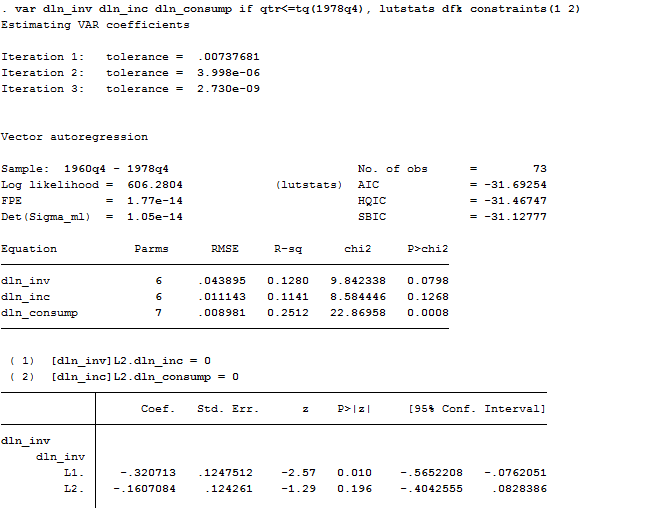 The dfk option specifies that a small-sample degrees-of-freedom adjustment be used when estimating the error variance–covariance matrix. Don’t panic, I will not deepen this part! As we can observe, the coefficients in the equation for dln_inv are jointly insignificant, as are the coefficients in the equation for dln_inc; and many individual coefficients are not significantly different from zero. Therefore, we can apply several constraint in order to have a cleaner picture of our data. constraint 2 [dln_inc]L2.dln_consump = 0 . 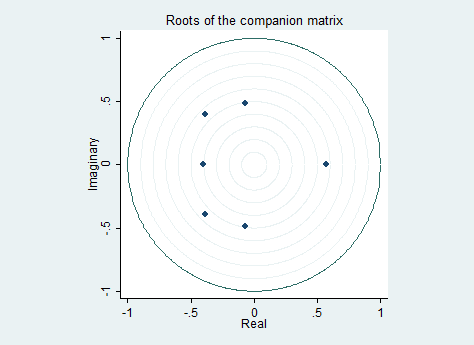 We are asking Stata to generate the liner prediction for the model. What’s new here, is the equation() option. This is extremely useful when dealing with VAR because allows us to specify for which equation we want to predict residuals, standard error and linear prediction. In this case I asked just for the first equation of my previous three-equation VAR. Nice, uh? Extremely useful for presentation also! The command fcast compute needs you to specify a suffix (like f1_) to the auxiliary estimations for your regressors because Stata will insert them in your dataset as new variables. 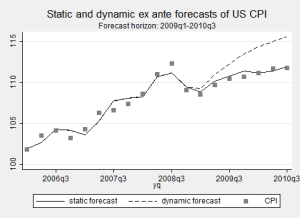 The step() option tells Stata to forecast 8 quarters out of the sample. fcast compute creates new variables in the dataset. As you may noticed after having launched the command, fcast compute generates 4 new variables for each dependent variable in your model: forecasted levels, lower bound, upper bound and standard errors. All of these follow the same structure: f1_nameofvariable_UB. If you want to graph the dynamic forecast you can use the command fcast graph. 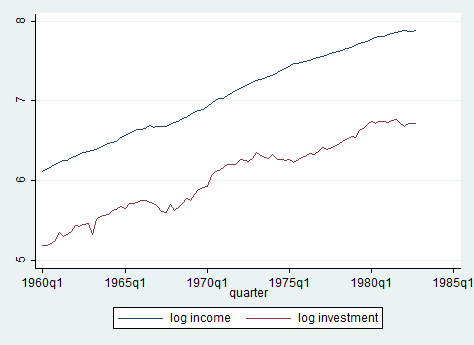 The graph shows that the model is better at predicting changes in income and investment than in consumption. The graph also shows how quickly the predictions from the two-lag model settle down to their mean values. Ok guys for today we are done! If you have any feedback on the topics of these posts or any suggestion on what to cover more, please comment below! Enjoy your sunday!